Tasty and creamy soup made with potatoes mixed with veggies and herbs. This potato soup is unique of the great rainy/cold-weather undoubtedly an all-time favourite, with people of all age groups.. Using carrots to garnish this aesthetically spiced soup adds not only flavour and crunch, but a lovely colour as well. This incredibly soothing food can be had as the maincourse or side dish along with breads. 1.Heat the butter in a pan, add the potatoes and onions and saute till the onions turn translucent. 2.Add chopped carrots and beans and the milk and 1½ cups of water and simmer till the potatoes & veggies are cooked. 3.Cool completely &Blend in a mixer till smooth and then strain the soup through a soup strainer. 4.Add the mixed herbs, salt and pepper and reheat the soup in a pan. 5.Serve hot garnished with carrots& Pepper powder. 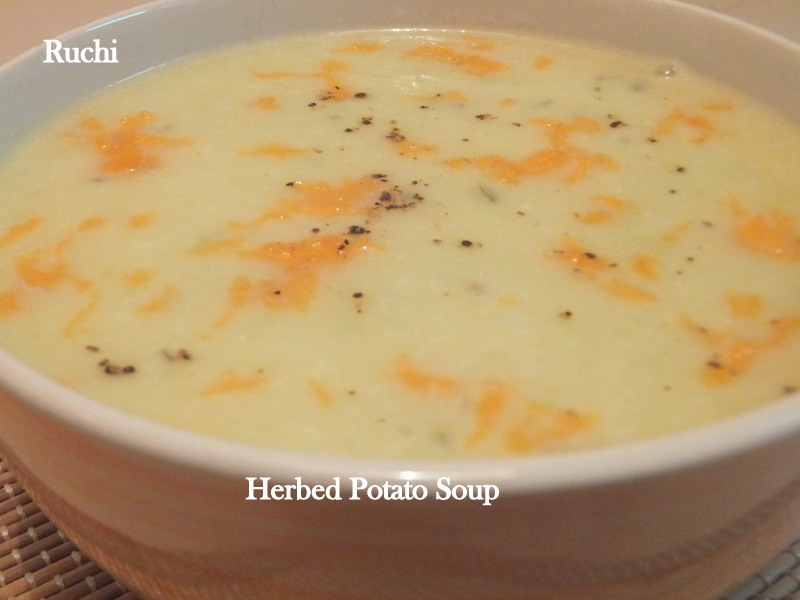 Healthy n yummy soup..nice recipe dear..
Wow,super creamy and healthy soup..Looks comforting. Creamy & wonderfully flavored!!! Quite a filling soup!! Hi Ruchi first time here the soup looks yummy. Glad to follow you do visit my space in ur free time.